God’s work is sacred. So when a person engaged in ministry repeatedly defies God’s high and holy standards, that individual is to be removed. The Apostle Paul’s judgment and command are uncompromising. The very reason God’s work is holy is because He is holy. Those who minister will never do so without some failures, because they are not holy as He is. God’s grace, however, is sufficient to forgive those frailties. But those who cover up a lifestyle of sin behind the façade of sacred ministry must be confronted and removed. The consequence of violating God’s sacred work, that which is performed for God’s glory and the body’s edification, is severe—disqualification from ministry—because His work bears His mark and reflects His reputation. Because this is true, God sets the boundaries in which His work is to be accomplished. The standards are high and holy. That is why Paul warned Timothy and Titus to treat with care any accusations against those who minister but to not falter when confrontation was necessary. Since the creation of humankind, God has been at work in the lives of His people. In His infinite creativity, God has varied the method by which His sacred work has been performed, but His standard has never changed: He requires holiness from those who serve Him. After the Lord led Israel out of slavery in Egypt and they wandered in the desert, doing the Lord’s work consisted of serving in the tabernacle, a portable building where the people worshipped. Priests who served wore sacred garments, did their work around sacred furniture, read the sacred Scriptures, and carried out sacred sacrifices for God’s sacred purposes (Exodus 39-40). Priests who failed to maintain the holiness of God’s work often paid with their lives, because God is serious about His work being done His way (Numbers 3:4; 1 Samuel 2:12-17, 22-25, 34). Under the reign of Solomon, the place for worshipping God changed from temporary to permanent with the construction of the temple in Jerusalem (1 Chronicles 28-29; 2 Chronicles 2-3). The structure may have changed, but God’s standard remained. God’s work continued to be sacred. Over the passing of time, the temple ultimately was destroyed because God’s people compromised His standards (2 Chronicles 36:14-19). After a time, and in His mercy and grace, God sent His Son to earth to die, removing the barrier of sin between God and humans. After He rose again and before He ascended to heaven, Jesus sent us His Spirit (John 14:16-19; Ephesians 3:16-17), no longer to inhabit temples “made by human hands” (Acts 7:48) but ones made by divine hands. No longer residing in a building, God has moved into the lives of His people (1 Corinthians 3:16; 6:19). We who are believers form “the church of the living God” (1 Timothy 3:15). From tabernacle to temple to hearts—God’s standard for holiness has never changed. It’s just more personal now. Paul’s admonitions in 1 Corinthians apply to all Christians, but they are to be of particular concern to Christian leaders. For both the layperson and the leader, God offers forgiveness. But for the leader who harms his or her body as well as the church, there is also judgment. As we will discuss later, Paul instructed Titus to deal with leaders drawn into the sin of factious strife and disputes. But first we will read how Paul instructed another young protege, Timothy, about how to handle sinful leaders. 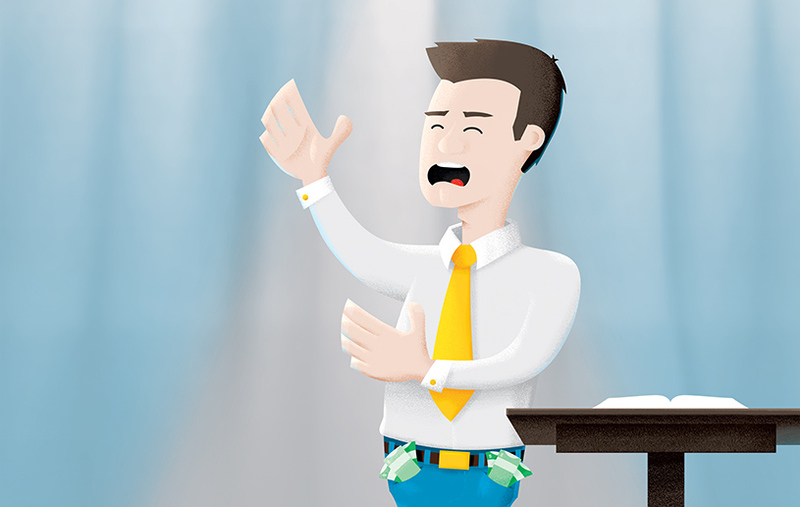 At times in the life of a church, an accusation comes against one of its spiritual leaders. So Paul instructed Timothy to tune out hearsay and turn a deaf ear to gossip or suspicious hunches and refuse to act quickly on every rumour. Setting the bar high, Timothy was to receive only hard evidence, accompanied by provable and viable facts, presented by “two or three witnesses” (1 Timothy 5:19). The offence, once verified, was not to be ignored, not secretly addressed, not overlooked, and not swept under the rug. Rather, the offender was to be rebuked “in the presence of all” (5:20). The reason was clear—“that the rest also will be fearful of sinning.” Since Paul was addressing leadership issues, most likely the “all” represents all who are affected by the offender’s leadership: all who have a need to know and all whose lives are directly impacted by the leader being accused. As information is shared openly, an appropriate fear will sweep over the people of God. If someone in the congregation is engaged in the same or similar sin, his or her heart will feel the sting of conviction. Paul took seriously the sacredness of God’s work. That’s why he impressed upon Timothy the need to maintain God’s standard of holiness. “I solemnly charge you,” Paul wrote Timothy (5:21). As one swearing an oath in court, Paul charged Timothy “in the presence of God and of Christ Jesus and of His chosen angels” to preserve the holy work of God within the temple, the church. And he said the principles of investigating and rebuking a sinning leader must never be carried out with “bias” or “partiality,” regardless of whom the accused was. He stressed that any leader who decides to lead a double life—one of sacredness in public but sinfulness in private—was to be rebuked. Engaging in God’s work is serious because it is sacred business. Therefore, Paul instructed Timothy to be cautious in laying his hands on anyone to commission them for holy service (1 Timothy 5:22). Paul instructed Timothy on the rebuke of a sinning leader. But what if that leader continues in his or her sin—continues to cover the stench of it under the perfume of sacredness? And, as was the case in Crete, what if his or her sin is causing factions to form in the church? What then? Paul was succinct and brutally clear: such a divisive person is to be rejected (Titus 3:10)! The word Paul used, paraiteomai, carried with it the stern action of “discharging” or “dismissing” someone. Or stronger still, to “drive [them] out.” Why such drastic action? If the person causing division, dissension, and unrest in the church is allowed to continue, his or her actions could destroy the church, the temple of God (1 Corinthians 3:17). This counsel is especially applicable to leadership in the local church, but it can also apply to any ministry. The sacredness of God’s work is not confined to the church’s four walls but extends to parachurch ministries, missions organizations, and scores of other ministries. The text tells us Titus was not to reject an accused leader without careful investigation. Just like Timothy, he was to take pains to confirm that the information was correct and warn the sinning leader, not once but twice, before taking action (Titus 3:10). If the one caught in sin didn’t heed the warnings, only then was he or she to be rejected. Why would such a person reject the opportunity to repent when grace is twice extended? Paul said it is because a divisive person is “warped and sinful” (Titus 3:11 NIV) or “perverted” (NASB). The word ekstrepho means to “turn aside,” to be twisted and bent out of shape. A perverted person can’t walk a straight line, like a drunkard stumbling in the darkness. He or she is in a sinning state, willfully choosing to violate God’s standard of holiness. As such, the individual has already condemned himself or herself. Perhaps nothing has more potential to blight the sacred work of God than wilful, deliberate, and repeated sinfulness by those engaged in ministry. That is why Paul was so pointed in his instruction—“Reject a factious man...[because he] is perverted” (3:10-11). If you’ve ever been in a church that has had to apply discipline to a wayward leader, you know the sadness and pain associated with “rebuking” and “rejecting” a beloved servant of God. If you’ve been part of a church that should have disciplined a sinning leader but didn’t, you know the frustration and anger of seeing God’s sacred work stained. If you’ve been a member of a church that has never had a “warped and sinful” leader, you are most fortunate. Regardless of your past experience, you or your church leaders may eventually be faced with doing the hard thing of confronting a sinning minister. If and when that day comes, here are five practical and proven principles to follow. First, we must have accurate information based on facts. If we are committed to maintaining the integrity of God’s ministry, we must be willing to do the hard thing. This requires the ability to discern and to listen only to hard facts—not hearsay, rumour, or innuendo. Second, we must undertake discipline only when it would be for the overall good of the ministry and be to the benefit of the individual. The sting from a ministry leader’s sin may prick our hearts, but our discipline must never be a personal attack. We must understand that sometimes removal is necessary for the sake of the church and for the purging of the sin in the individual’s life. Third, we must discipline in a spirit of genuine love and care for the person. We must also keep in mind that the fallen leader is loved by the Lord and our call is to love him or her as Christ does. We don’t uphold the sacredness of God’s work if we don’t discipline God’s way—in grace. Fourth, we must carry out the action only after much prayer. In our zeal for truth, we may be tempted to simply cut off the sinning leader, but we must submit to the wisdom of the Spirit. We must approach the situation with integrity, discernment, and humility. Finally, we must have as our goal the restoration of the individual. Discipline should never condemn but should seek complete repentance and reconciliation of the individual. There are times when doing the hard thing is, in fact, the best thing. This is especially true when it comes to God’s sacred work. He has always held an increasingly high standard for those who handle His Word and work with His people. James, the half-brother of Jesus, understood the high and holy work of a minister. That’s why he warned: “Let not many of you become teachers, my brethren, knowing that as such we will incur a stricter judgment" (James 3:1). For the leader refusing to repent of his or her sin, part of that “stricter judgment” involves consequences of rebuke and rejection. Though no one relishes administering such judgment, God’s work is too important to avoid the hard thing of confrontation when it really is the best thing for the church and the sinning leader. Adapted from Insight for Living, “When Doing What’s Hard Is Best,” Tough Grace in Difficult Places: A Study of the Book of Titus Bible Companion (Plano, Tex. : Insight for Living), 91-100. Copyright © 2007 by Charles R. Swindoll, Inc. All rights reserved worldwide. 1. Walter Bauer and others, eds., A Greek-English Lexicon of the New Testament and Other Early Christian Literature, 2d rev. ed. (Chicago: University of Chicago Press, 1979), 616. 2. Bauer and others, eds., A Greek-English Lexicon of the New Testament and Other Early Christian Literature, 245.